Apple have been issued a new patent by the U.S Patent and Trademark Office today for a touch pad that removes the clickable aspect of the integrated button and replaces it with force sensors for tactile feedback. The patent, numbered 8,633,916 for anyone keeping count, has been issued for a “Touch pad with force sensors and actuator feedback,”. The current design of trackpad as found in the Apple MacBook range feature an integrated button where a user presses on the trackpad surface which forces a hinged mechanism located at the rear of the touchpad to shift allowing movement of the front. The front then hits a switch that provides the clicking noise. 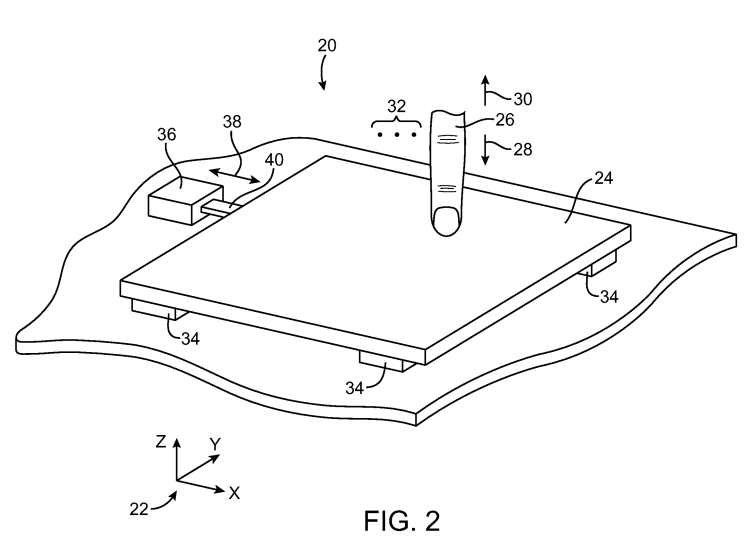 With the new patent technology Apple has been issued, the solution incorporates at least four force sensors situated at the four corners of the trackpad. The sensors may be filled with nano-particles which generate voltage relative to the amount of compression exerted on them, and therefore providing a reference point for measuring the pressure of a click. As for the touch-sensing side of the technology, the patent mentions a few methods, including light detection and surface acoustic wave detection. The benefit of moving towards the sensors as opposed to the current clicking design is that the force sensors can be used to perform button-type operations without the drawbacks of an integrated button design, mainly that there doesn’t have to be any moving parts involved. This can reduce mechanical failures of the trackpads – a common symptom of older laptops. It is also said that the new force sensors save room in the MacBook, allowing Apple to further reduce the size of their already tiny laptop lineup. As noted in the patent, a normal force sensor may be displaced less than 0.05mm under the most forceful of button presses. The new trackpad design can also be programmed to relay a force feedback to the surface which mimics a click for those acustom to feeling some feedback after a button press. They can even be extended to provide a clicking sound to give that satisfying sound we’re all accustomed to. Apple’s force sensor trackpad patent was first filed for in 2009 so perhaps we may see it on a MacBook model in the near future.